The Komodo dragon (Varanus komodoensis), also known as the Komodo monitor, is a large species of lizard found in the Indonesian islands of Komodo, Rinca, Flores, Gili Motang, and Padar. A member of the monitor lizard family (Varanidae), it is the largest living species of lizard, growing to a maximum length of 3 metres (10 ft) in rare cases and weighing up to approximately 70 kilograms (150 lb). As a result of their size, these lizards dominate the ecosystems in which they live. Komodo dragons hunt and ambush prey including invertebrates,birds, and mammals. It has been claimed that they have a venomous bite; there are two glands in the lower jaw which secrete several toxic proteins. The biological significance of these proteins is disputed, but the glands have been shown to secrete an anticoagulant. Komodo dragon group behaviour in hunting is exceptional in the reptile world. The diet of big Komodo dragons mainly consists of deer, though they also eat considerable amounts of carrion. 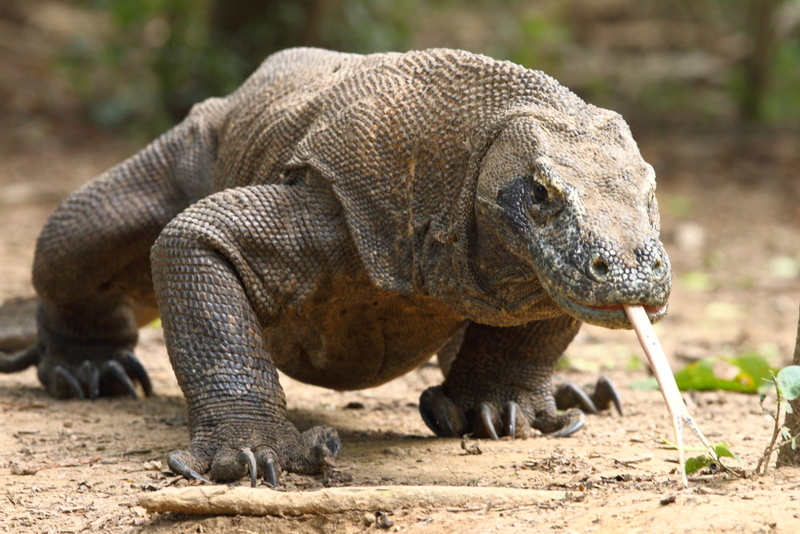 Komodo dragons also occasionally attack humans in the area of West Manggarai Regency where they live in Indonesia.